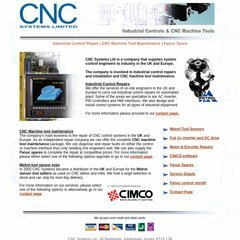 cncsystemsltd.co.uk CNC Systems Ltd - Repair and Supply Spares for Industrial Controls ..
cncsystemsltd.co.uk CNC Systems Suppliers of Metrol Tool Sensors, CNC Lathe cutting ..
cncsystemsltd.co.uk CNC Systems Suppliers of Permanent Battery Replacement units for .. The site is programmed for PleskLin. There are 3 Nameservers, ns3.mcldns.net, ns2.mcldns.net, and ns1.mcldns.net. PING (94.126.42.209) 56(84) bytes of data. A time of 98.4 ms, is recorded in a ping test.